Toews was skeptical at first, given all of the false alarms he’s received—someone once told him she’d seen the hybrid offspring of a pigeon and a duck, when in fact she’d just seen the common American coot. 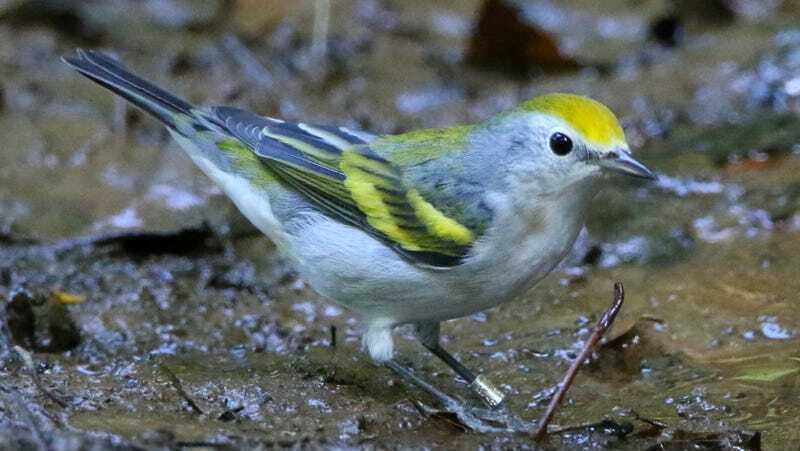 But he’d long been looking for a hybrid between the Vermivora genus, containing the blue-winged and golden-winged warblers as well as their hybrids, and the Setophaga genus, containing the chestnut-sided warbler. Male chestnut-sided warblers regularly fight the Vermivora warblers over territory, but it’s unclear how they’d interact with females, according to the paper published in Biology Letters. Burket’s report, bolstered by his birding know-how, seemed to fit the bill. A female Brewster’s warbler hybrid in 2017 (left) and a male chestnut sided warbler (right), both taken from Burket’s pond. Perhaps that’s where the three-in-one warbler’s parents met. The three-in-one warbler’s presumed family tree. Graphic: Blue-winged, Golden-winged, and Brewster’s Warblers by Liz Clayton Fuller; Chestnut-sided Warbler from del Hoyo et al. (2018) Handbook of the Birds of the World Alive; new hybrid by Jillian Ditner. Graphic courtesy of the Cornell Lab of Ornithology. Birds are just looking for love. Sometimes, if they can’t find the right mate, they’ve got to settle.